Through our partnership with VisionFund International, the microfinance (MFI) arm of WorldVision, we offer an innovative financing package to propel farmers and their families into taking that critical first step. VisionFund has a dedicated focus on reaching the most vulnerable households through a network of MFIs that span a wide range of rural areas. And promoting irrigation is just as attractive for finance providers as it is for helping farmers. With higher, consistent, and better quality crop yields, farmers generate higher and more consistent incomes – making repayments and subsequent lending more likely. Our partnership has already been successful in Zambia, where we’ve introduced an irrigation-specific loan product tailored to farmers that has been piloted among over 3,000 farmers with close to a 95% repayment rate. The product features a low upfront commitment, an initial grace period to allow for the cultivation and sale of crops, and bundled complementary agricultural resources. 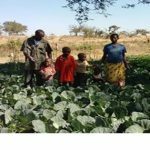 The Chiinda family of Zambia went from relying on rain-fed farming and struggling to get by, to increasing their income by 4 times as much! 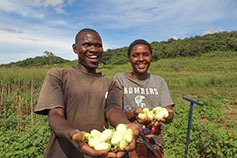 Mr. Chiinda had seen one of our pump demonstrations, and applied for and received an irrigation loan from VisionFund. In just 10 months, the family grew enough crops to pay back the loan and send their two oldest children to school for the first time, and still have leftover income to save. Now eligible for additional financing, Mr. Chiinda makes money on a weekly basis – and plans to buy two cows, improve his thatched home, and put all of his children through school. With access to financing, farmers have an easier time transitioning from rain-fed to irrigated farming – and a shorter climb into prosperity for their families and communities.